SCHEDULE 18/19 - Bienvenue sur le site du Quatuor Ellipsos ! sacred music, music gospel or works for organ who characterize so well The Musics of Churches. making be next to musics of yesterday and today. of the meeting with the public takes generally all its sense.
" Rare and precious qualities " that is what characterized the saxophone, according to Hector Berlioz. 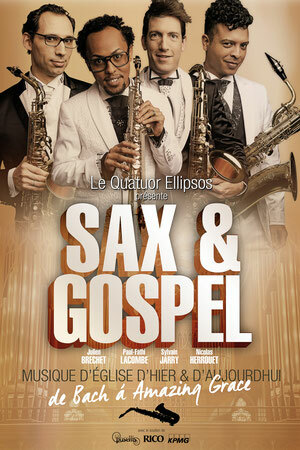 The Quartet Ellipsos makes us discover the saxophone tinged with Blues. through a program tinged with blues, dreamlike and energetic. and also visually thanks to a video projection. In a rich musical universe, printed by colors from the east of Europe. An European recital, in the positive and moving energies for all the public! From Isaac Albeniz to Thierry Escaich, of the saraband in the tango, the public travels during more than one hour during this recital in the well-paced and dance themes. in the very first album of the Quatuor Ellipsos, "Medina"(2007). the Quatuor Ellipsos owed pay a glowing tribute to this big visionary ! This program which travel the 20th century emphasizes all these composers who wrote for the saxophone so contributing to the enrichessement of its directory. This recital invites the spectacteur to discover most right-hand pages of the French musical directory. 6/ ÇA FAIT QUOI DU CLASSIQUE AU SAXOPHONE ? which we qualify as " classic period " today. and these geniuses of the classical music?